The BEST Biscuits and Gravy! 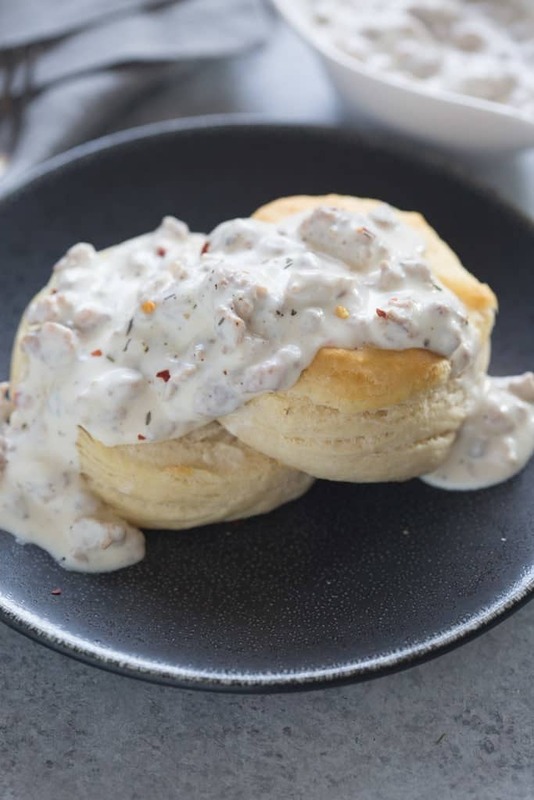 An easy, southern-style sausage gravy with flaky homemade biscuits. One of our favorite breakfast recipes of all time! It’s no secret that a yummy homemade breakfast makes me excited to get up on Saturday morning. I love making something fun and delicious for my family, since our weekday breakfasts usually consist of plain old oatmeal or scrambled eggs and toast. This sausage gravy recipe is a TREASURE to our family–thanks to my mother-in-law. She’s made it so many times she has completely perfected the recipe, and now it’s one of our favorite breakfasts. The sad thing is that I can never order “biscuits and gravy” from a restaurant any more. I know from experience that it would pale in comparison to this recipe. But the good news is that homemade sausage gravy is just about one of the easiest things in the world to make. What is sausage gravy made of? 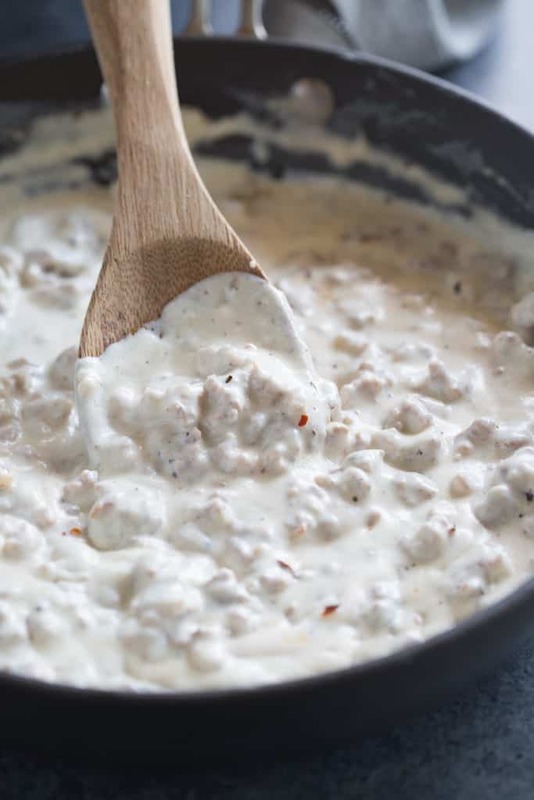 This simple sausage gravy is made with pork sausage, flour, half and half, butter, thyme, rosemary, and crushed red pepper! It’s delicious. Pair it with my absolute favorite homemade, light and flaky buttermilk biscuits and you will be in heaven! 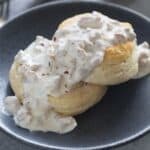 The BEST Sausage Gravy and Biscuits! 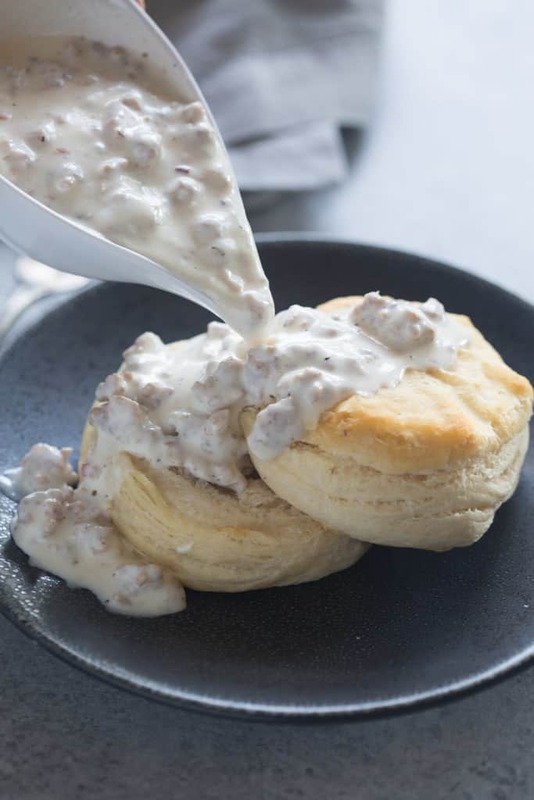 An easy, southern-style sausage gravy with flaky homemade biscuits. One of our favorite breakfast recipes of all time! Brown sausage in a large saucepan. Use a paper towel to blot out most of the grease from the pan. Add flour, butter, and half & half. Cook on medium-low, stirring often, for several minutes until thickened. Add thyme, rosemary, red pepper flakes and black pepper. I will not wait the weekend to make Sausage Gray and Biscuits. I’ll do my best today for dinner! Thank you ! I have to refrain from making this every weekend. My husband goes crazy over this recipe. The biscuits are PERFECT and the gravy is on point. GREAT recipe! Tried this but I made my own biscuits from scratch. I can’t make enough. I showed other people how to make it. My wife has wanted to try this four days and begged me to make it. I will start by saying, I had to start cooking when she became disabled and have had to learn how to Cook many meals. It is not a joy of mine, but has become a necessity. I will say this, we just finished eating the meal and she had the biggest smile and exclaimed, “Oh my god baby, this is delicious” I loved it myself. It was easy, which I love. Great recipe, try it. We had to use 3 cups of milk and 1/4 cup of flour, I didn’t have half & half. Thanks mother-in-law. Sausage gravy is something that I was raised on. However, for better flavor, I keep the grease from the sausage to make the roux for the gravy. This sausage gravy was delicious! Best I’ve ever had. Thank you! Thanks Pam! I’m so glad you liked it. I was wondering if this gravy reheats well? I was going to make it ahead and take it with me on an overnight trip. I thought it would be good for breakfast the next day. Yes it does! Make it and refrigerate it or freeze it. Reheat in a saucepan. You will want to add a splash of milk or cream to thin in out a little and then add additional spices to make up for that. 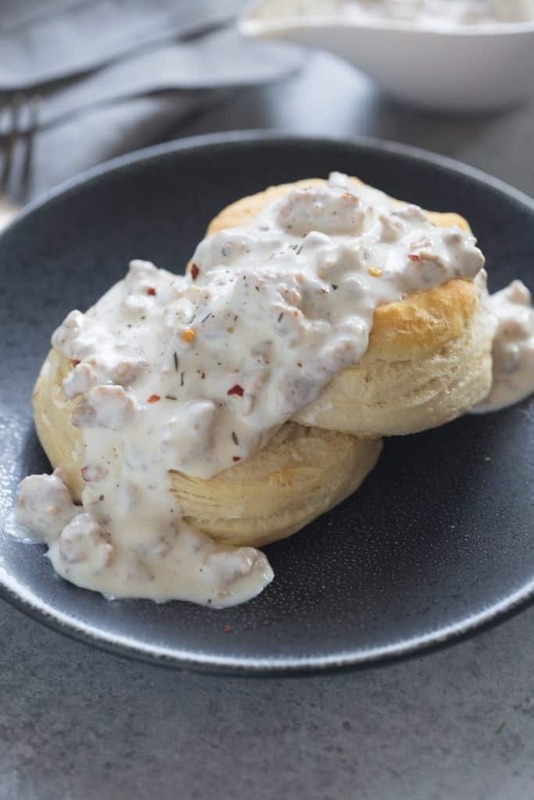 Hands down – the BEST sausage gravy recipe! I use Sage flavored pork sausage when I can find it in the store.